Two old women clad in bright red are sitting with their backs facing me , having an animated conversation over a cup of tea. One of them has her arms outstretched in front of her , as if she is pointing to the sky which is glowing in shades of pink and gold. 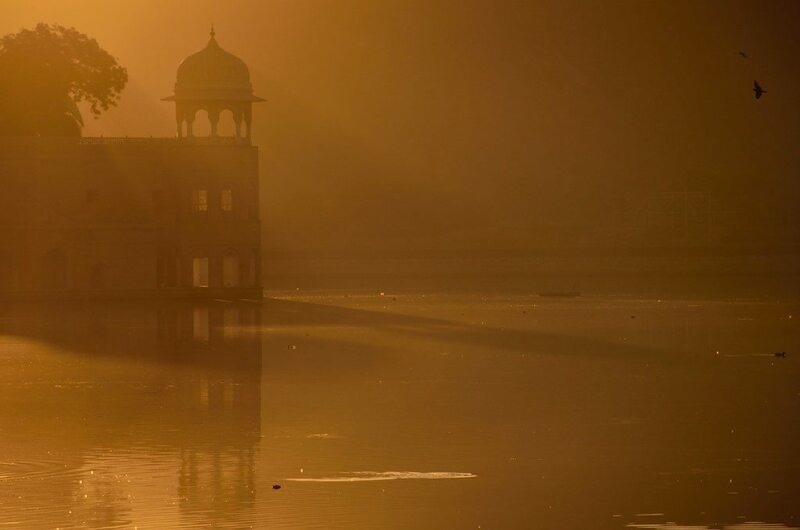 It is dawn and I am at Jaipur, watching sunrise over the 300 year old Jal Mahal, one of my favourite Jaipur tourist attractions and things to see in Jaipur. I look at the two women who are still busy in deep conversation and I wonder if they are as fascinated by the beauty of the scene as I am. I love observing people and I wonder if she is calling out to someone, asking them to join her. Perhaps I will never get to know as they slowly walk away. The pigeons interrupt my reverie as a flock of them fly right in front of my eyes. Flapping around and exercising their wings, they are virtually everywhere. 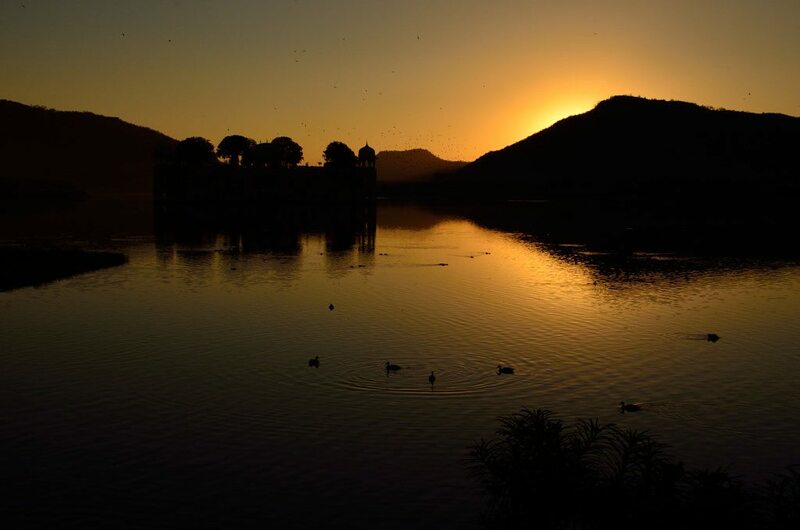 The Water Palace of Jaipur, one of the Jaipur tourist attractions built by Maharaja Sawai Pratap Singh in the middle of the 18th century stands silhouetted against the beautiful sky. Built in typical Rajasthani architecture, the palace has five storeys, of which four of them are under water. For a moment, everything looks like a perfect picture postcard. The hauntingly beautiful palace was apparently a summer retreat of the royalty and a picnic spot , especially when the royals gathered to go duck hunting. 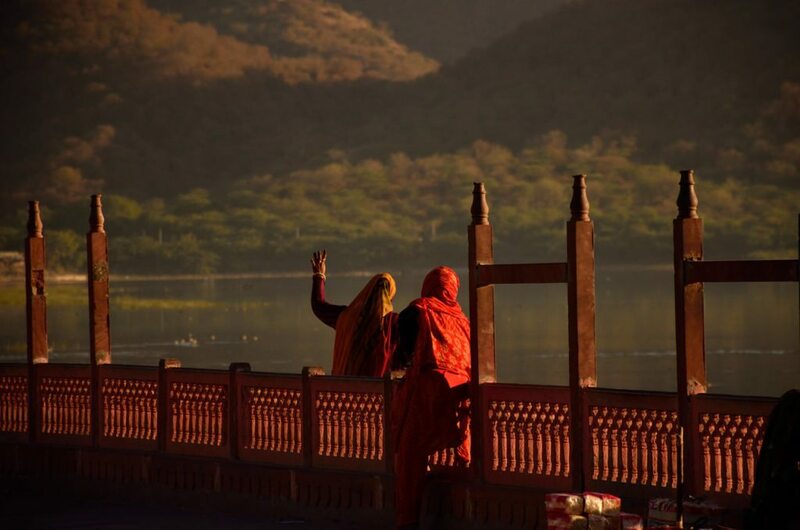 The waters of the man made Man Sagar Lake , one of the things to see in Jaipur are drenched in shades of the sunrise as the sun paints the sky with its hues. Every sunrise and sunset tells me a story – of a beautiful place, a special moment, a sudden discovery , a new learning. 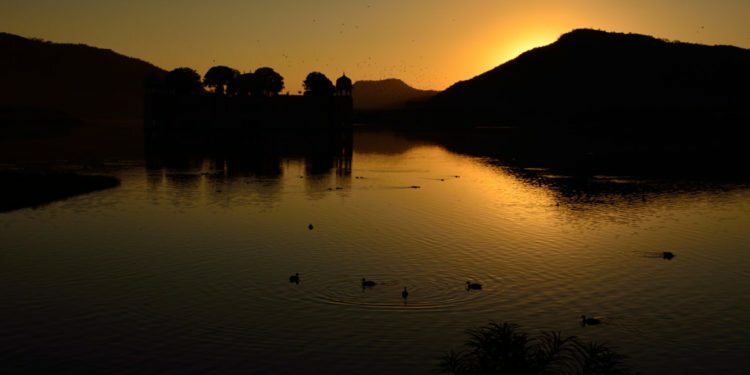 Rajasthan to me is always about colours and the Jal Mahal is my favourite destination in the Pink City and one of the destinations in a Jaipur itinerary. I walk around aimlessly. An old lady offers a cup of hot ginger tea. Some of the locals buy food for pigeons and the fish in the lake from her. I see a few old people praying to the sun. I ask her if there is a temple around and she smiles, showing me her toothy grin and says that the sun and the water are their deities as they give us life. She is amused and surprised when I ask her if I can take her picture. And then she poses for me with a big smile. People for me make places. The tea adds to the warmth of our conversation. We do not share stories but we watch the sunrise together over a cup. Moments like this to me are the very essence of travel. We meet several men and women in the course of our journeys and they last for just a few minutes and yet I often wonder what untold stories fill their lives. This is not my first trip to Jaipur. I came here for the first time almost fifteen years ago when I was on a holiday. And the memories are still vivid as I lost myself in the palaces and forts and felt like a princess in a dreamy city.On this trip however I am hosted by Hotel Clarks Amer, the oldest five star hotel in Jaipur which is a landmark by itself. My travel companion is a popular guide, Sharmaji who virtually knows every nook of the Pink City and who plans my Jaipur itinerary. According to Sharmaji it is not really pink. It is terracotta ,a shade of pink that stands for hospitality . I ask him how Jaipur became the Pink City and he mentioned that then Maharaja, Sawai Ram Singh wanted to impress Prince Albert when he visited India in the 19th century and decided to paint the city pink . 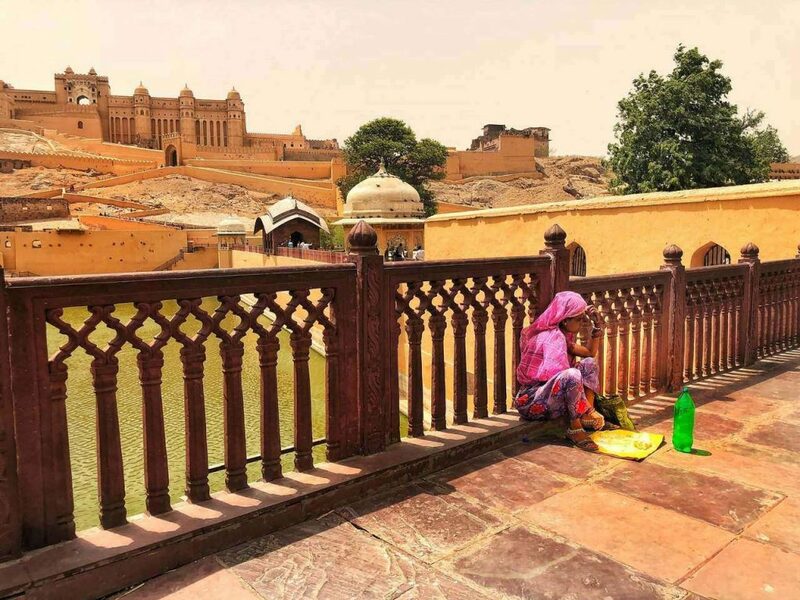 Legends however say that it is the queen who decided on the colour as she was rather fond of it.But the name Pink City was eventually given to Jaipur by Lord Albert. My entire Jaipur experience can be heard on my podcast, Travel With Lakshmi on a mobile application called Storytel . But for now, let us continue with the narrative. Driving through the Pink Gates of the Old Town, the traffic suddenly picks up as we negotiate cars, autos and even an elephant is on the move. Sharmaji immediately talks to me about Teej, a festival of swings which is celebrated as a union of Parvati and Shiva. 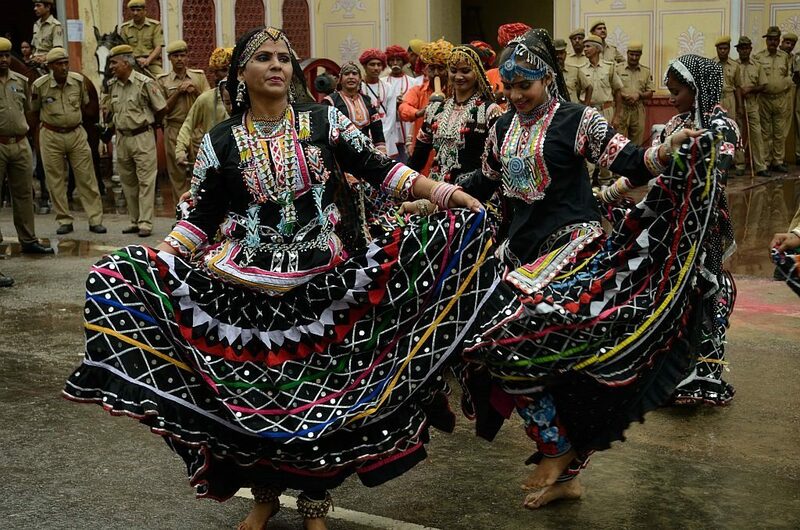 It is a festival that usually starts around the onset of monsoons and the highlight of the festival is a procession that starts right here from the Tripolia Gate. caught in traffic. 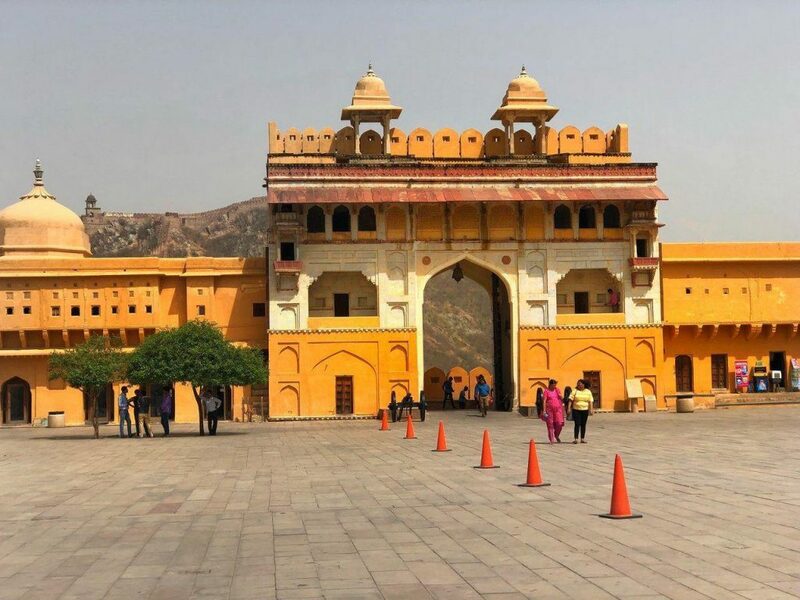 This is the heart of the city literally with its City Palace, the Hawa Mahal, Jantar Mantar and of course Bapu Bazaar, which are all Jaipur tourist attractions and are part of Jaipur sightseeing tour. The forts of Rajasthan are not the only UNESCO World Heritage Sites. 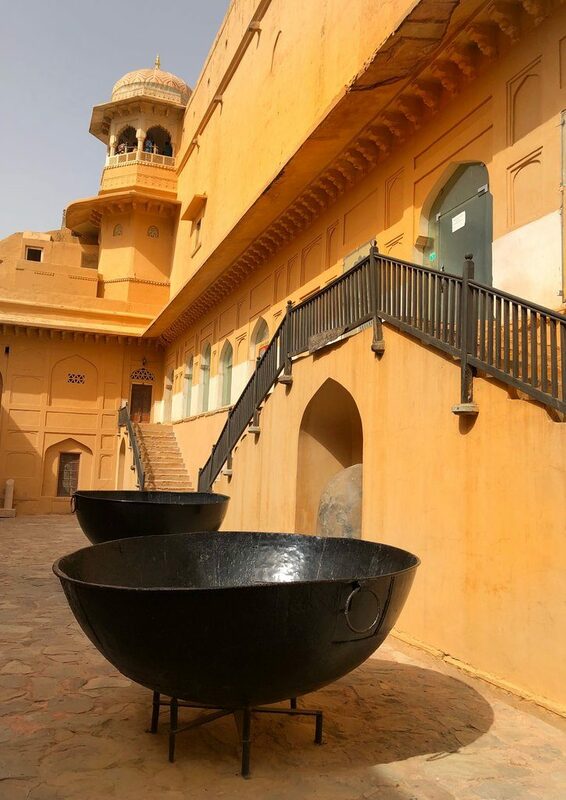 A collection of 19 architectural astronomical instruments form the Jantar Mantar, a UNESCO World Heritage Site, which is one of the things to see in Jaipur. Built by Raja Jai Singh, the Jantar Mantar in Jaipur is one of the five astronomical clocks and has been maintained well and is one of Jaipur tourist attractions. The Hawa Mahal or the Palace of Winds , which is one of the key Jaipur tourist attractions next door literally takes your breath away . 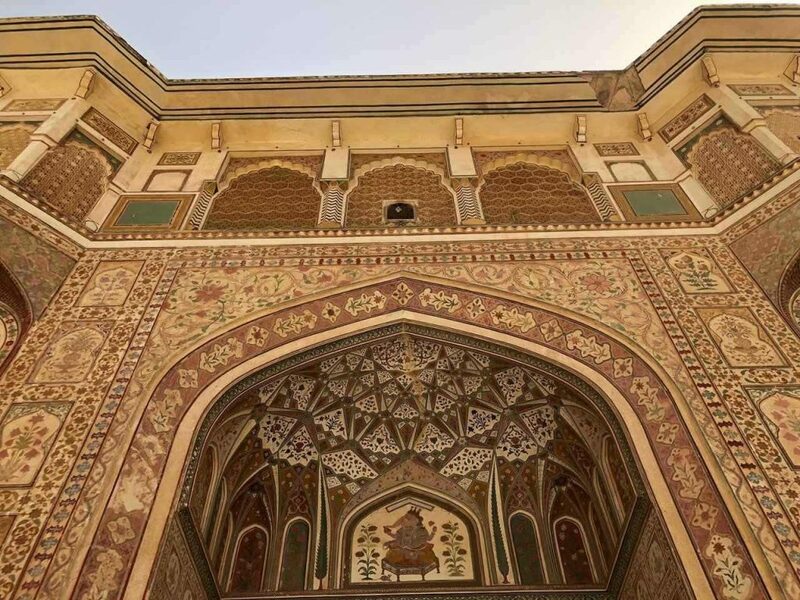 The Palace of Winds in Jaipur looks like a collection of bee hives as there are over 953 windows or jharokas with intricate lattice work from where the queens would look at the streets and watch an event or a procession or a festival. The wind would blow in through these tiny windows cooling the palace even during summer. I climb the rooftop of the shop opposite to the palace to take a photograph. That is when I realize that the facade is not really the frontal view of the palace but it is the rear. Hawa Mahal is a masterpiece. I have seen so many monuments but nothing comes close to this five storeyed palace built of pink and red sandstone. It is believed that Maharaja Sawai Prathap Singh was so impressed by another Wind Palace called Khetri Mahal in Jhunjhunu that he built the Hawa Mahal, one of the things to see in Jaipur modelled on it and he made it even better. History for me however is not just about facts. It is an experience. It is about walking on the ramparts of an old fort and imagining battles fought and won during the period. It is about standing at the edge of a stepwell and admiring its geometric proportions. The toll of the bells from an old temple, the grandeur of a palace, the charm of the ruins – these form a part of history for me. 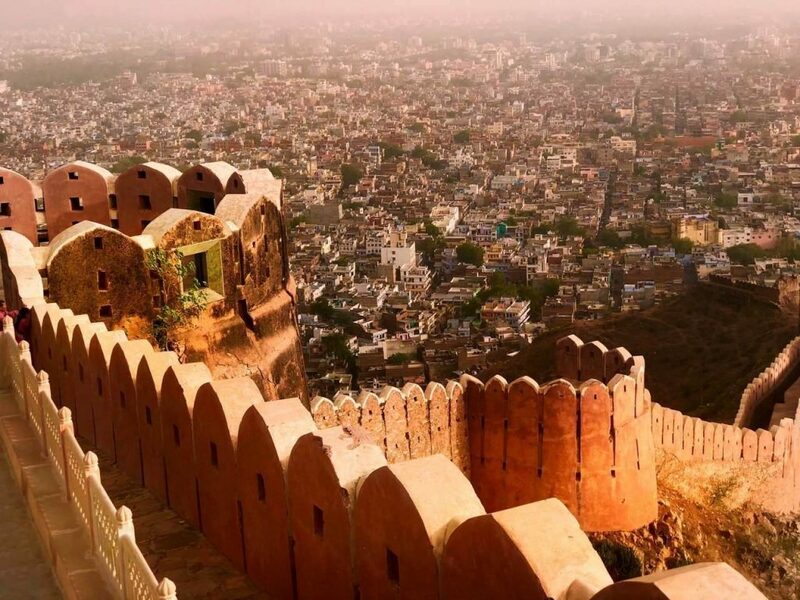 But Jaipur is synonymous with the forts , which speak of the Rajasthani valour. 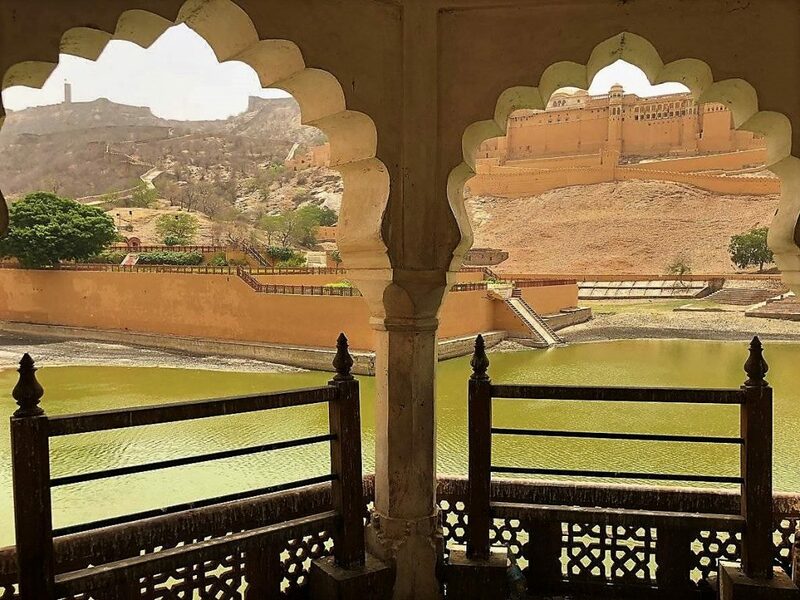 We decide to brave the heat and head to the three famous forts near Jaipur – Amer Fort, Nahargarh Fort and Jaigarh Fort, all connected together by underground tunnels. Every Jaipur sightseeing includes these popular Jaipur tourist attractions. 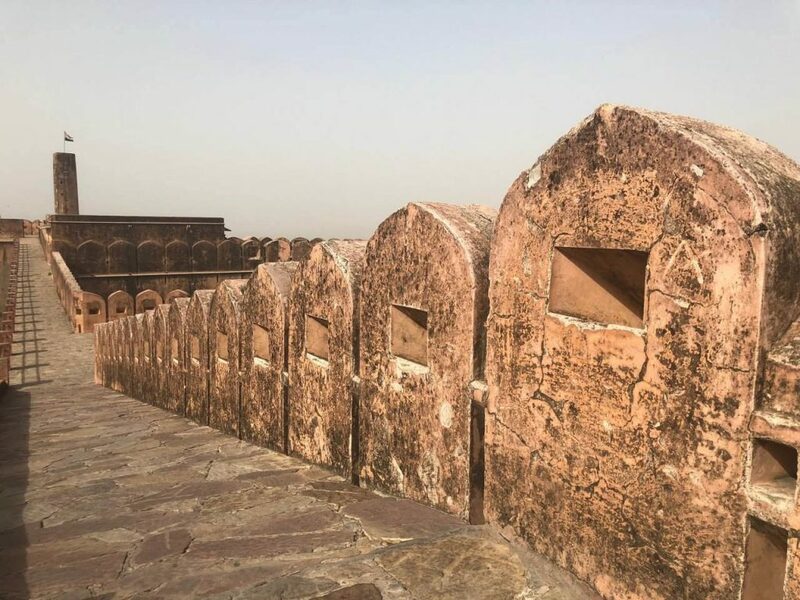 Amer Fort along with five others have been given the UNESCO World Heritage Site status and is one of the most formidable forts in the state. It is also one of my favourite things to see in Jaipur. Our first halt is the Amer town but we do not go to the fort as yet. Amer is the older capital of Rajasthan and it was Maharaja Jai Singh 11 who built a new town called Jainagara or Jaipur after him. 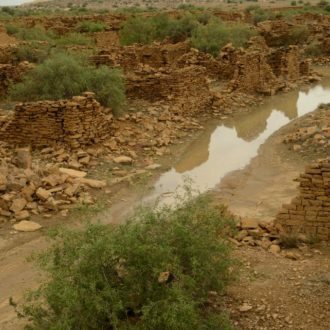 Amer or Amber as it was called is a dusty little village filled with ruins of havelis, temples and stepwells. The sun is now beating down on us but that does not deter me from heading to Panna Meena Stepwell, one of Jaipur tourist attractions. I have never seen anything more beautiful than this. A couple are posing for photographs and they are the only tourists out there on this hot afternoon. 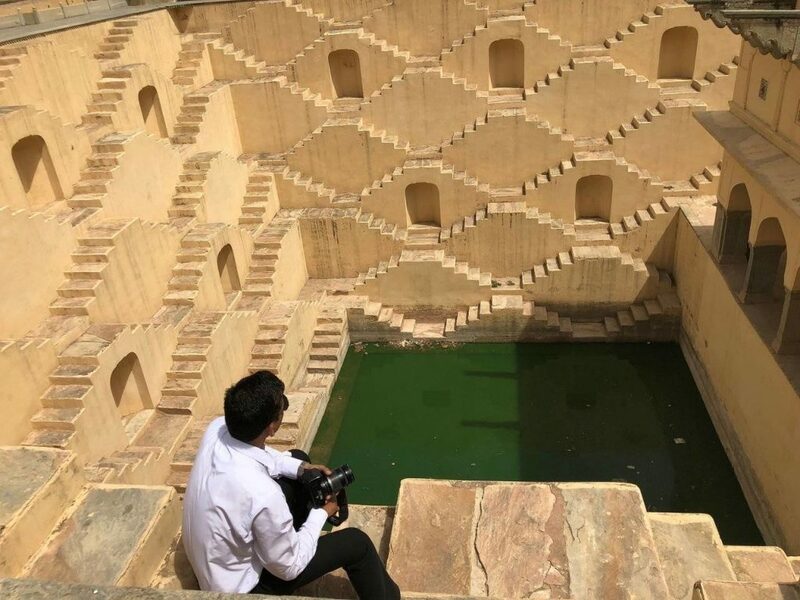 Panna Meena Ka Kund ,one of the things to see in Jaipur was built along the 16th century and Sharmaji told me that no one can climb and down on the same set of staircase. An old temple stands close by which forms a part of Jaipur sightseeing. I see so many ruins of crumbling homes but the heat does not let me linger for a longer time.We quickly find some kachori and kalmi vada and binge on ghevar and wander around. I wonder how this village would have been like when it was the reigning capital town. We continue driving until the sight of the formidable fort overlooking the Maota Lake brings us to a halt. I am speechless. The fort was built by the warrior tribes referred to as Meenas and was later ruled by Raja Man Singh 1. Within the ramparts are gates, palaces, temples and other monuments. The fort however took over 100 years to build and it was taken over by successive kings who completed it. Even after the capital was shifted from Amer to Jaipur, the fort dominated the landscape. 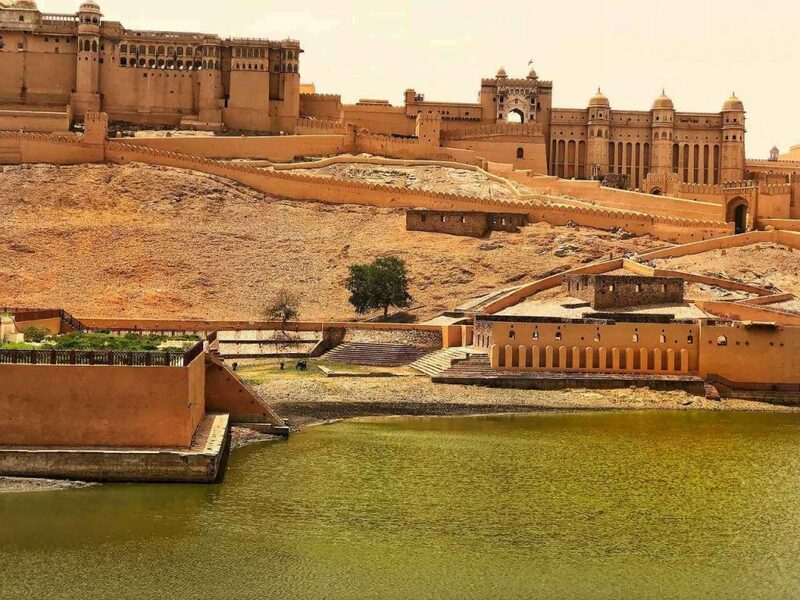 It was called the Amber Fort as well and was apparently named after the Goddess of Fertility, Amba Mata . Sharmaji however says that it is also dedicated to Shiva as Ambikeshwar whose temple is located on the Cheel ka Teela or the Hill of the Eagles. However he just prefers to call it Amer fort. There are many stories around it. One of them says that a stone will decide the fate of the fort. According to a legend, there is a linga on the bed of the Maota Lake. ot os believed that if the stone is submerged by the lake, then it will also mark the destruction of Amer town as well. Nevertheless it is now looming large in front of me, with its magnificence reflecting on the waters of the lake. However this was not the original Amer fort. Perched adjacent on the Cheel Ka Teela is the Jaigarh fort which was the original fort built in the 11th century. However for now, my entire attention has been grabbed by the Amer Fort. Sharmaji pauses his history class for a moment as I take some photographs. The fort built of marble and red sandstone is more like a opulent palace built on four levels with courtyards. The seven gateways are massive and larger than life. Enter the public courtyard through the Suraj Pol and this is where you could see elephants marching ahead with the army. The two storeyed Ganesh Pol looks like an opulent palace by itself. It is only apt that this grand gate leads you into the royal quarters of palaces . 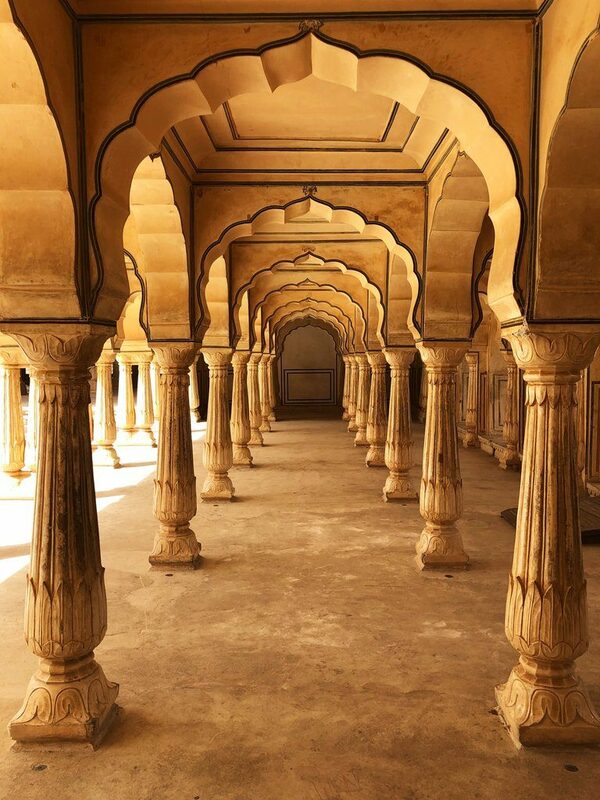 There are several halls like the Diwan-i-Aam or “Hall of Public Audience”, the Diwan-i-Khas, or “Hall of Private Audience”. 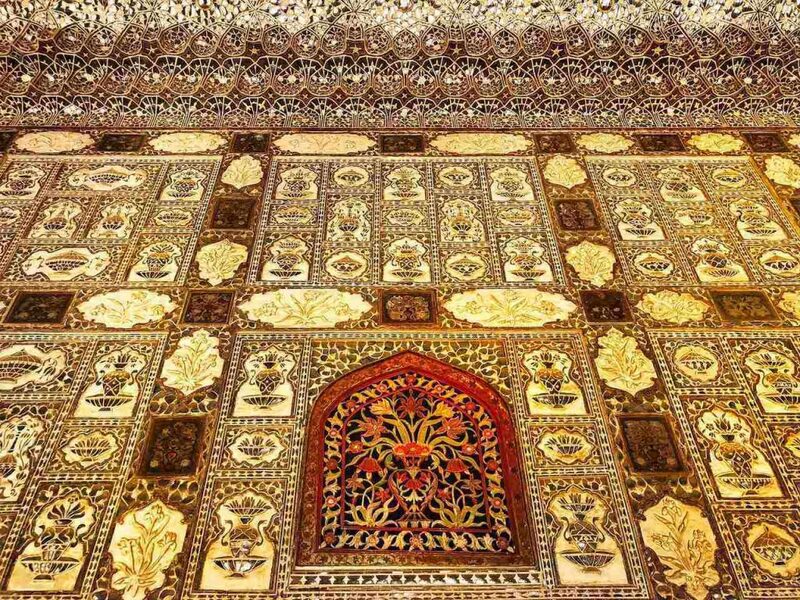 I am however fascinated by , the Sheesh Mahal or the Palace of Mirrors where every piece of glass reflects a bit of you. This is one of the most popular Jaipur tourist attractions. The broken tiles of mirror along with the coloured glass looks so enchanting that it seems like precious stones and gems surround you. According to Sharmaji one candle is enough to light up the entire palace and it would glow and glisten even in the dark. There are several images carved on the pillars and walls of the palace but one of them is referred by the guides as the Magic Flower. It seems like a pretty flower at first glance but when you see it from different angles, optical illusion takes over. Sometimes you see two butterflies by the flower, at other times you could even imagine that you are seeing a scorpion or a fish tail or even a cobra. I of course can see just the butterflies flitting about. Sharmaji fancies himself as a photographer and decides to take pictures of me and my reflection in the glass. 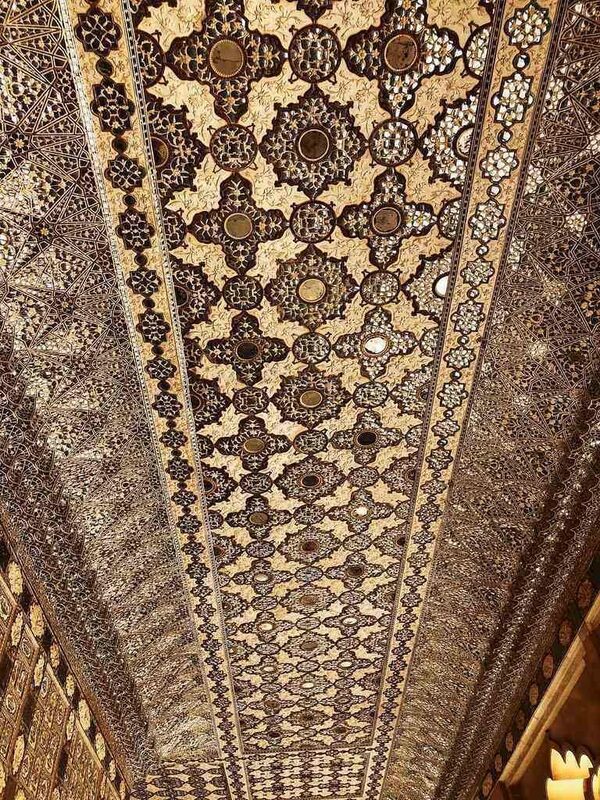 The Sheesh Mahal is obviously the most crowded of all palaces and everyone is busy with selfies or posing. I am curious about the Sukh Nivas where apparently the temperature was kept cool by artificial winds blowing over a fountain inside the palace. The king apparently had 12 mistresses and he built a palace for each of them. Many movies have been shot here and I recognise scenes from Jodha Akbar especially where Aishwarya Rai’s character Queen Jodha decides to cook in some massive vessels. The vessels are still placed here as we discuss the culinary skills of the Rajputs. 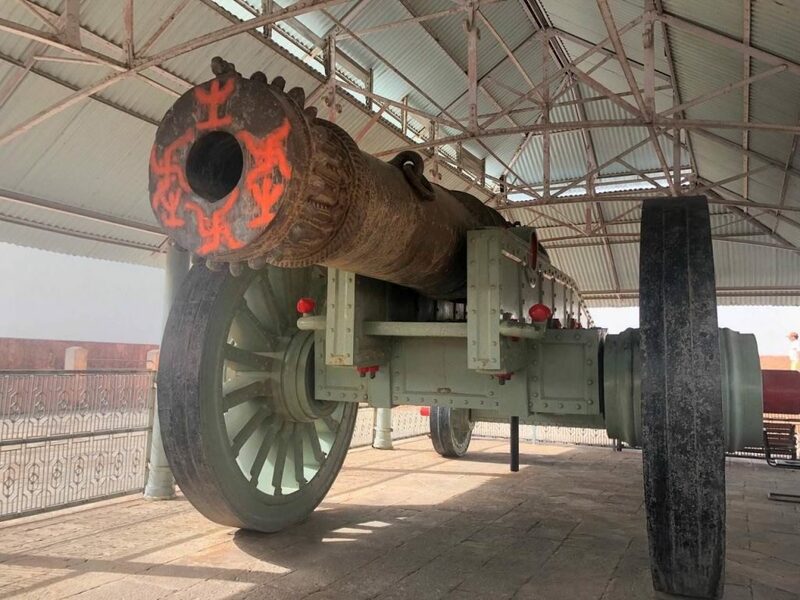 I head next to Jaigarh Fort, which is one of the places to visit in Jaipur where the largest canon on four wheels, weighing about 50 tonnes, called Jaivana stands. The barrel alone is about 20 feet with a diameter of 11 inches. Apparently Jaivana was never used on any enemy but it was tested once when it covered a distance of 35 kms. According to Sharmaji the noise was so loud that several pregnant women living in the neighbourhood unfortunately lost their babies. But Jaigarh has much more fantasy tales echoing from the walls. You can even go on a treasure hunt here. Apparently Indira Gandhi, the former PM did and no one knows if she found any or not. Some say that the treasure hidden here by the former kings were found by Maharaja Sawai Jai Singh and was used to build Jaipur. Finally we are at Nahargarh , which is there in almost every Jaipur itinerary , where I head to see sunset. However it is a hazy day and all I can see is the city of Jaipur wrapped in dust. There is a dry stepwell close by and am told that Rang De Basanti was shot here. Nahar may be referred to as the abode of tigers but locals believe that it was haunted by Nahar Singh Bhomia, a prince . Apparently a temple stands here today in his name to pacify his spirit. Even the name of the fort was changed from Sudarshangarh to Nahargarh as a dedication. But it is the beautiful Mahavendra Palace built by Sawai Madho Singh for his nine queens that is more breathtaking. Finally I end my tryst with the citadels with performances from Michael Jackson and Shakeela , puppets who break into a jig to apparently capture more audiences. A small bed lies in the corner. I walk up the stairs that lead to the terrace and lose myself in the hazy view. “Bahut Shanti Milegi,” comes Babaji’s booming voice and he is right. There is so much of peace around. I end my tryst with Jaipur on this note and I realize as I drive back towards Hotel Clarks Amer, who had hosted me, I had literally painted the Pink City Red with a dash of terracotta shade. 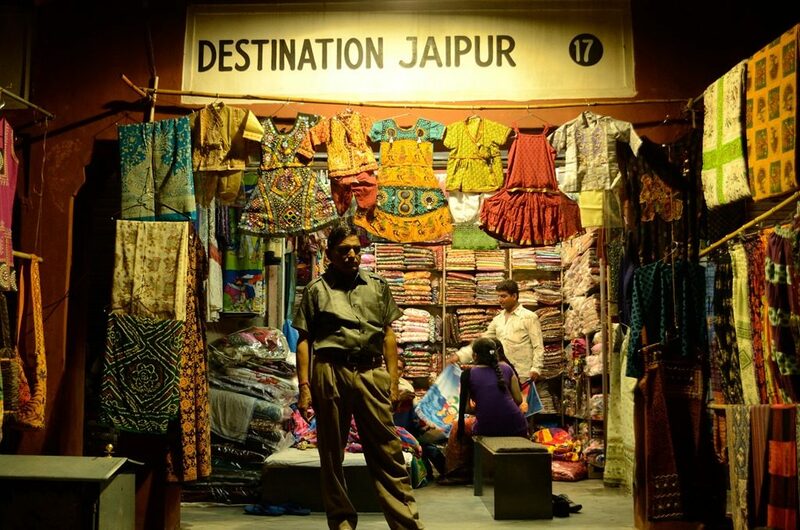 The entire travelogue of Jaipur can be heard on Storytel, in my podcast – Travel With Lakshmi. Download it on your mobile now.